We provide a dedicated nursing staff to handle all skilled dementia patients. We have a secure unit that provides them with a specific activity room devoted to keeping them active. This unit is also very spacious which enables the residents to have a lot of movement. Dementia is a gradual deterioration of mental functioning, such as concentration, memory, and judgment, which affect a person’s ability to perform daily activities. The first step in treatment is to understand the individual including history and physical health. Our interdisciplinary team with the involvement and support of our mental health partners evaluates each individual and develops a tailored care plan. We believe that often the behavior exhibited by those with dementia is an expression of unmet needs. We work to discover and address those needs in a compassionate and dignified way. 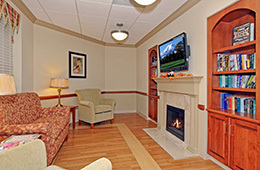 Montevue Assisted Living does have a secured environment for those who may be at risk for elopement.